The smoked salmon toast ($14) begins with a slice of sourdough toast smeared with herb cream cheese and piled high with sliced cucumbers, microgreens, pickled red onions and a lemon. For a dish that turns a breakfast staple on its head, visit Toastique at The Wharf. Since the toast and juice bar’s opening this summer, Toastique has been serving gourmet toasts, smoothie bowls and juices in a light and airy space located at 764 Maine Ave. SW. As the name implies, Toastique’s menu focuses on hearty slices of toast topped with a plethora of fresh ingredients. Each menu option reimagines the dry breakfast side you may be used to, but one stands out above the rest. The smoked salmon toast ($14) begins with a slice of sourdough toast smeared with herb cream cheese and piled high with sliced cucumbers, microgreens, pickled red onions and garnished with a lemon. You could likely create a dish that resembles this at home until it comes to the main event: smoked pastrami salmon. The salmon is coated in a traditional pastrami spice blend of black pepper, garlic and paprika, giving it a smoky, meaty flavor. By itself, the sourdough toast is soft and chewy on the inside with a slightly crunchy exterior. The thin layer of cream cheese is rich and savory – without the herb flavor being overpowering – while the cucumbers and pickled red onions add a crisp crunch. If smoked salmon isn’t your thing, Toastique offers a plethora of other options ranging from sweet and savory toasts to smoothie bowls, cold-pressed juices and kombuchas. For something on the sweeter side, order the PB crunch toast ($10) with honey roasted peanut butter, strawberries, blueberries, bananas and granola, drizzled with honey on a slice of raisin walnut toast, or a dragon berry smoothie bowl ($12) made with dragon fruit, mango, strawberry and coconut water and topped with strawberries, kiwis, goji berries, coconut and granola. On-tap kombucha ($4.50) or a collagen latte ($5 to $6) made with almond milk in flavors like matcha, blueberry lavender and beet are also offered to wash down your meal or stand as your lone purchase. The shop is a health food haven with simple wood paneling and bright light coming in through the windows. A pop of color from a light green mural of D.C.’s street grid makes the shop more personal, and plants help warm up the sleek space a bit. Customers can opt to sit at high-top or traditional tables, or attempt to brave to cold on the cafe’s outdoor seating. 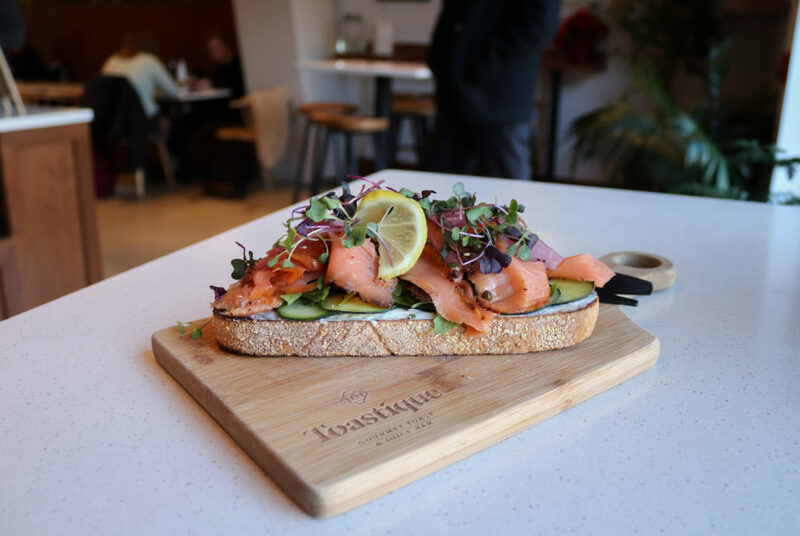 The store is open every day from 7 a.m. to 7 p.m.
Take a break from studying and head to Toastique to try a new take on an old classic with the smoked salmon toast.